In recent years, Hemphill Fine Arts has mounted numerous exhibitions of local 20th-century artists, notably the Washington colorists who arrived in the 1960s. So it’s unsurprising to see paintings by Gene Davis, Leon Berkowitz and Thomas Downing in “35 Days,” the gallery’s summer group show. But these are grouped with pictures by contemporary artists who work in the same tradition, as well as drawings, sculpture and photos. The result is a museum-worthy survey of D.C. art. Davis’s 1978 “Flamingo” consists, unsurprisingly, of vertical stripes. But they’re soft rather than the artist’s usual hard-edge bands. Berkowitz’s 1968 “Cathedral 22” also is striped, atypically, and places some rigid lines amid the graduated tones for which he’s known. Hanging comfortably with these works are recent ones by Steven Cushner and Linling Lu. The first repeats simple forms in drippy blue atop a mottled backdrop; the second is a cool-colored target whose rings are precisely defined but whose sky-blue center gives a sense of openness. 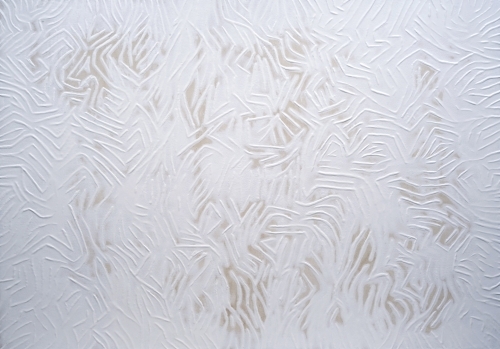 Also included are a pulsating 1969 Downing grid painting and Robin Rose’s recent white-on-white encaustic. Two delicate ink drawings by William Christenberry, who died in 2016, abut Anne Rowland’s “Floating Christenberry,” a view of Potomac foliage that reminded the photographer of the late artist’s views of his native Alabama. (Another version of this image is traveling through Arlington as part of the county’s “Art on the ART Bus” program.) Rowland’s tribute is just one of many cross-generational links in this impressive array.